Mustang Island is an 18-mile barrier island connected to the mainland with causeway bridge at one end and a 24-hour ferry at the other end. It is nationally recognized as one of the best islands in the United States and has some of the best Texas Gulf Coast beaches. It has a rich history and its first inhabitants were the Kawakawa Indians and the island derived its name from the number of wild horses left on the island by the Spanish in the 1800’s. Your perfect Texas beach vacation is in Port Aransas. 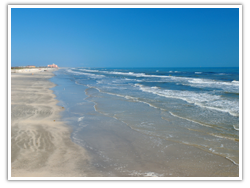 At the Port Aransas, Texas beach, sunbathers, and beachcombers will find miles of white sandy beaches, while surfers, boaters and sailors play in the waters off the Texas gulf coast. While visiting Port Aransas beach, enjoy world-class fishing. Whether you want blue marlin, sailfish, red fish, snapper, tuna or trout, the fishing guides know “where they’re biting,” and will show you a day of fun and exciting Port Aransas fishing.